Milos is a volcanic island in the Aegean Sea. It has been inhabited since prehistoric times and has offered significant mineral wealth over time: obsidian in prehistoric times, kaolin and pozzolan in historical times and up to today, and, recently, bentonite and perlite. The island has a horseshoe shape and its many beaches render it a favourite tourist destination. The famous statue of Aphrodite, currently in the Louvre (Paris) was found in Milos in 1820, while a copy is hosted in the archaeological museum of Milos, in Plaka. A famous statue of the Hellenistic era, found in Milos in 1820. The statue has found by a farmer named Georgios Kentrotis, who, not knowing its archaeological value, used it as part of the fence for his field. When the French archaeological service realized its value, it immediately bought it from the farmer for 400 guria. Many looters have tried to steal it, without success. The statue was loaded and transferred to the Louvre Museum in Paris, where it is today. During the forcible transfer, both arms of the statue were lost. The Archaeological Museum of Milos hosts an “original copy” of the statue, made in the laboratories of the Louvre museum. A few years ago, an investigation carried out in the port revealed 2 male hands, belonging to another unknown statue. The catacombs, dug in a volcanic tomb, are amongst the island’s most important sites. The catacombs were discovered by looters and became known after their looting, in 1840. Together with five aisles and a burial chamber, the catacombs form a labyrinthine system with a total length of 185 meters today. These had entrances from the outside world, but now only one functions, that of the second catacomb of the “Elders” [Presviteroi], from where visitors can enter. Inside the catacombs, right and left on the walls, there are the “arcosolia” (dug arches), in which, as in the floor, the tombs were opened. Today 126 dug arches survive (Petrochilos, 1972) and are estimated to host thousands of buried remains. Each tomb used to have a lamp; today, they have been fitted with electric bulbs that illuminate the area discretely, reproducing the atmosphere of the distant past. Christian symbols or inscriptions were commonly drawn on the tombs of the most distinguished persons. Ross (1843) and Soteriou (1927) had the opportunity to see and study such decorations, but, over the years, most were destroyed. One such inscription still survives in the second catacomb, in the sixth right dub arch. It is the inscription of the “Elders”, from which the catacomb takes its name. In the middle of the same catacomb there is a tomb in the form of a sarcophagus, dug in the rock. It is believed that it hosted the remains of one of the first martyrs of Christianity and that early Christians used it as an altar in their services. The activity of early Christians in the catacombs stopped shortly after the establishment of religious tolerance (Order of Mediolana), or after the destruction and abandonment of the ancient city of Klima due to earthquakes in the 5th or 6th century AD. Milos is famous for its filigree shores. With over 75 large and small beaches, crystal blue waters, colourful carved rocks and golden-white sandy beaches, you are sure to love it. Due to the volcanic origin of its soil, Milos has a spectacular topography and variety of beaches. You will find both golden-white sandy beaches and small bays surrounded by pebble stones and white, red, yellow or black rocks. Its sea offers unique colours and a variety of depths, while you can choose between fully equipped or more secluded and wild beaches. The clear waters of the island and the infinite beauty of its beaches will definitely offer you an unparalleled experience. Regarding access, the roads to most northern and the southern beaches are very good. Those on the east and west side of the island are rather difficult to reach, as most of the route is dirt road. There are also some beaches (such as Kleftiko, Gerakas, Sikia and many others not listed below) that you can only visit only by sea, joining the sea excursions that start from Adamandas. Finally, we suggest you choose beaches to go swimming not only on the basis of their beauty, but also according to the direction of the wind. When the winds north-eastern or northerly, it is best to choose beaches inside the bay, or even better on the south side of the island. In contrast, when the wind is southerly, we recommend the beaches on the north side of the island. A safety net for the European Habitats and species threatened with extinction. The network of NATURA 2000 areas of the European Union is an initiative of an open civil society that measures the impact of human disregard for nature, expresses concern for the risks accumulating and cares, through scientific research and laws, to prevent irreparable damage to the ecosystem… It is also a far-sighted policy, which seeks to ensure the sustainable development of locations endowed with unique natural features, combined with their cultural wealth and tourism potential. The inclusion in the NATURA 2000 network of two extremely important, rare habitats of the island acts as a safety net: these are the inland and coastal areas of the western part of the island. This decision shielded the natural balance and biodiversity of the ecosystem… At the same time, it formed a promise of development and a hopeful portent for the future of a privileged place, which, up to now, one-dimensionally exploited the environment yet can now multifariously use, with moderation and respect, its natural wealth. Milos: a vivid recollection of the troubled childhood of the earth. A mountaintop of Eurasia, which stayed afloat in the archipelago, with signs of the prolonged insomnia of volcanoes scattered everywhere, on its back and insides. Healed craters, caves embroidered on the coast, restless sea meteors and hot mineral springs summarize two million years of chain explosions – systematic notes in the calendar of creation that eventually took form in an island, still showing all variations of frozen lava: Obsidian, perlite, bentonite, kaolin, pozzolan, sulphur, barite, gypsum, alum… Deposits beneath the earth’s sources – sources of life for humans since the dawn of prehistory and until today. Rocks on its skin – exhibits in a unique natural geological museum. They once lived on land. Twenty-five million years ago, their ancestors moved into the seas, swam through time and arrived to the present few and tired. They are the seals Monachus monachus, the rarest mammals in the ecosystem of the Mediterranean, threatened by extinction in the waves of human indifference to the environment. Once the favourite creatures of gods and humans, they were then persecuted for centuries; today, they are once more the protected animals of a culture that sees its natural wealth dwindling. In the deep blue world of Milos, the Monachus monachus seals find their ideal refuge. In the volcanic folds of its coasts, which form numerous sea caves, and the nearby islands of Kimolos and Polyaegos, they find the space and time they need to rest and nest. Thus, not unfairly, the sea of the island is the considered one of the most important habitats for the Mediterranean seal – a welcoming ark that saves the sacred animals that were once protected by Apollo and Neptune. Plaka is the capital of Milos, greeting the visitor at an altitude of roughly 220 meters above sea level. In Plaka there is a Health Center, the Police Department, the Town Hall and other public services. 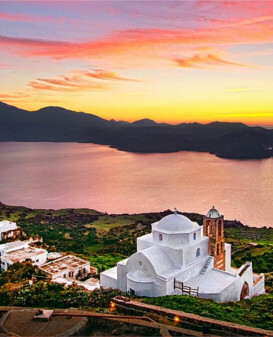 Along its beautiful, stone-paved alleys and the white, island-style houses, there are restaurants, little shops and the church of “Birth of Virgin Mary” or Korfiatissa of Milos. From there, you can enjoy the breathtaking view, and why not, a romantic sunset.